Testimonials | Liberty Sand & Gravel Inc.
Our drivers are some of the best-trained in the industry. Our trucks are meticulously maintained. It’s no wonder others refer to our drivers as fighter pilots and we rule the road. Be admired by your peers, home every night and enjoy some of the best pay in the industry. 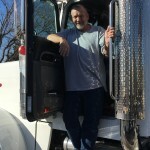 Most of our owner-operators started working with us with one truck and have steadily grown their fleets. We’re like family. Let us help you reach your goals. Roll with the best!